The Wolverine Jacket has been worn by Hugh Jackman in the American film “X-Men Origins Wolverine”. It was based upon Marvel Comics fiction story and the wolverine was the main character of this film. The super hero Hugh Jackman performed this role amazingly and appeared in Wolverine Jacket. He is still in the memory of the viewers and those who are fashion lovers like him for his stunning look. The outer shell of the jacket is made from genuine leather or faux leather. The Wolverine Leather Jacket has three brown stripes on both sleeves which has formed outstanding appearance. The 100% polyester lining gives durable sensation. Two front large zipped pockets of Wolverine Leather Jacket gives more space. The sober brown shade attracts too much. The high neck collar with buckle is the important feature of the jacket. 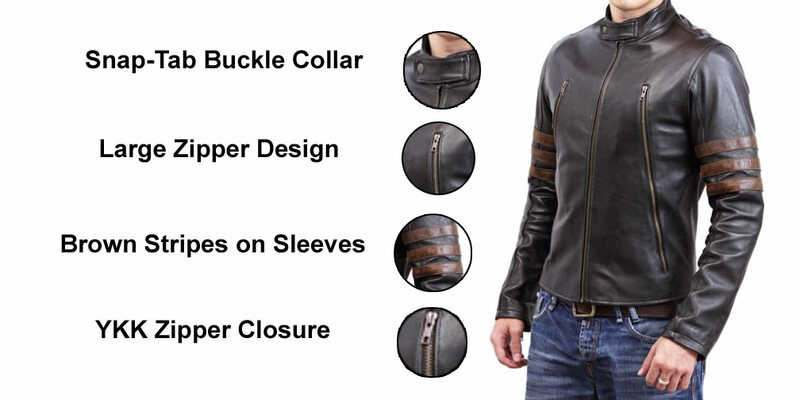 The zipper cuffs also give you opportunity of easy wearing of X Men Jacket.